Losing weight can be a real struggle, especially because things like donuts and pizza aren't usually considered slimming foods, and they're damn near impossible to resist. Dramatic weight loss is especially impressive when people choose to overhaul their lifestyles in favor of more whole foods, exercise, water, and probably fewer donuts and pizzas. Although every body is different, and people can find weight-loss success from a variety of methods, the Paleo diet has proven to be both popular and effective. This caveman-style eating plan includes lots of vegetables, meat, some fruit, and nuts; basically whole foods found in nature. 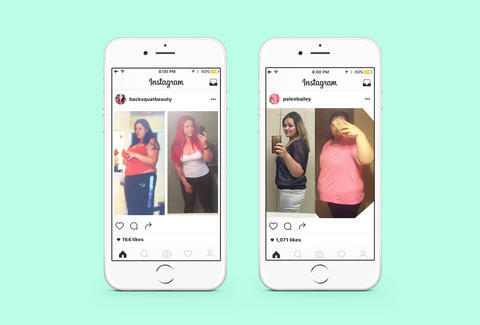 If this sounds like a nightmare to you, then take a look at these before and after photos from Instagrammers who lost an impressive amount of weight after going Paleo. Their dramatic transformations might just have you reaching for that bunch of kale. Christina Stiehl is a Health writer for Thrillist whose diet starts on Monday. She swears. Follow her on Twitter: @ChristinaStiehl.